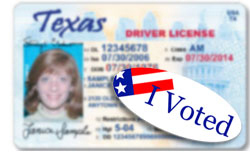 On Monday, the Texas Senate is expected to meet as a Committee of the Whole to consider Senate Bill 14, legislation that would require a voter to present proof of identification when voting. Earlier this week, Governor Rick Perry declared the Voter ID legislation as an emergency item and Lt. Governor David Dewhurst immediately informed state senators that the bill will be considered next week. All 19 Republican State Senators have signed on as co-authors to this important piece of legislation. The tentative schedule is to hear invited testimony on Monday, January 24th and public testimony begins at 8:00am on Tuesday, January 25th. The Republican Party of Texas would like to thank Governor Perry, Lt. Governor Dewhurst and the Texas Senate for making this a priority issue, and encourage all Texans who are concerned about the integrity of our elections to urge their state senators to support the passage of SB 14.